These soups live up to their name – they’re quick and easy to make, and have the flavor of an “all day long” soup in just 40 minutes! 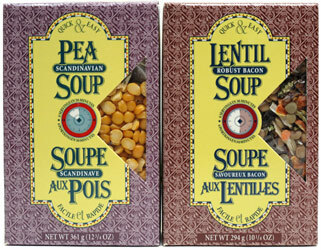 Made without animal by-products, MSG or preservatives, these soups have a rich blending of herbs, spices and smokey vegan bacon that combine with the peas and lentils perfectly, making them taste so unique that you could easily pass them off as your own recipe made from scratch (don’t worry, we won’t tell!) With only 2g of fat per serving, these soups are high in protein and fiber and are also rich in vitamins A, C, and folic acid. Available in two flavors – Lentil Bacon and Yellow Split Pea Bacon. 12.75 oz. (361g) packages of soup are $6.99 each. From Anonymous of Alexandria, Virginia on 1/1/2019 . Had the lentil. Makes a lot of soup. It was bland. Added sàlt and I still thought it was flavorless. From SKasper of Fitchburg, Wisconsin on 10/29/2018 . From Anonymous of Portland, Oregon on 12/15/2015 . I eat both of these, the lentil and split pea versions. This product keeps me coming back to vegan essentials because I can't find it anywhere else. They are delicious on their own and even better with add ins. I love having this mix to throw on the stove for a quick soup. Yes, buying the ingredients separately would create equal results, but having this helps in a pinch. And depending what i have around, I might eat them as is, or might throw in other things. Great for a quick weeknight dinner on a cold night. I never noticed a bad smell or an overwhelming taste like the previous reviewer. From Jen F. of Atlanta, Georgia on 4/29/2012 . I like the taste of soy bacon bits but the smell of bacon when cooking this soup was overpowering.